The elliptical galaxies differ from the spiral galaxies by the absence of cold gas discs, where young stars can be formed. It is thought that the ellipticals were formed by the merger of two or several spiral galaxies, merger which causes a burst of star formation, which consumes and makes all the gas disappear. When an elliptical galaxy swallows a small companion galaxy, some vestiges of the event remain for a certain time after the merger of the two galaxies, in the form of ripples and shells. These shells resemble the ripples or the waves which develop at the surface of water after one threw a stone in a pond. Shells constituted by stars have been frequently observed around elliptical galaxies, since the 1980’s. However, it is only very recently that atomic hydrogen gas was discovered associated with stellar shells, by the americans Schiminovich et al. The discovery of this gas was a surprise, because in theory, in a collision between two galaxies, the diffuse gas should lose all its energy and be driven towards the center to be consumed by star formation. a) Une image optique de la galaxie Centaurus A. Les coquilles stellaires sont soulignées en jaune (elles ne sont normalement visibles que dans les images très profondes). Les contours de la distribution du gaz d’hydrogène atomique sont en blanc. De plus, Centaurus A a un noyau actif, qui émet un jet radio, ici en bleu. b) et c) Les spectres en émission de monoxyde de carbone CO dans les coquilles S1 et S2 (regions indiquées par les cercles rouges). Intrigued by these observations, the astronomers of the Paris Observatory V. Charmandaris and F. Combes sought to discover whether this diffuse atomic gas might hide the existence of denser molecular clouds, much less dissipative, who could form like the stars shells around elliptical galaxies. This search, financed by the European Community, proved to be fruitful in several elliptical galaxies, and in particular in Centaurus-A. 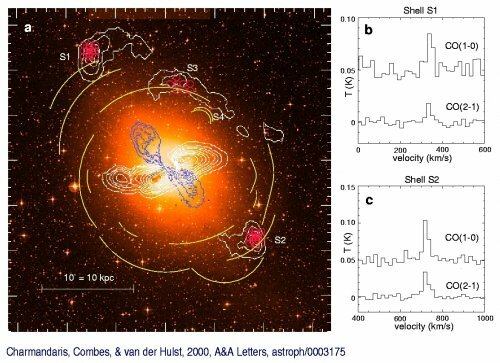 In this galaxy, observed by V Charmandaris, F Combes and Dutch astronomer J-M. van der Hulst , with the 15m diameter telescope of the SEST (of ESO, European Southern Observatory, located in Chile), carbon monoxide molecules were discovered in two shells surrounding the galaxy (cf figure). These observations make it possible to understand how the gas can be found very far from the center of the galaxies after a collision, and form new stars there.